Writer and zoologist Davies celebrates the “big, beautiful, complicated pattern” that is life on Earth. 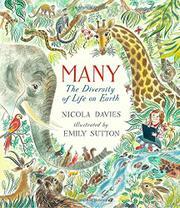 Starting with “one, two, three”—a roach, an observant child, and a flowering bush—the narrator then leaps to the concept of “MANY,” asking young readers and listeners to think about the many, many kinds of living things that inhabit our planet. The freckle-faced rosy-cheeked white girl who explored the world of microbes in Davies and Sutton’s Tiny Creatures (2014) returns to observe creatures large and small living in widely varied habitats. One striking double-page spread shows the rich diversity of a coral reef; the next depicts and labels 31 different species found in just the last 50 years. For the most part these folk-art–inspired, intricate watercolor paintings are placed on a white background that includes a relatively simple narrative for reading aloud and further detail in captions in a smaller, italicized font. After the display of abundance and a reminder that living things depend on each other in complicated ways, the author gently advises us that “human beings are destroying pieces of the pattern….” A pair of spreads show first a lushly populated rain forest and then the same area with some trees cut down and animals leaving; the third in the sequence shows a museum exhibit of extinct species. We can’t survive as one.